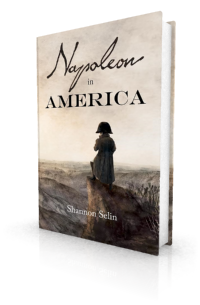 Napoleon was not known for his sportsmanship (see my post on interesting Napoleon facts). Billiards was one of the most popular games in late 18th-early 19th century France. How was Napoleon at billiards? Game of Billiards by Louis-Léopold Boilly, 1807. One can guess why Captain Coignet tried to see what he could whenever Marie Louise stretched herself across the billiard table. The first recorded reference to a billiard table is found in a late 15th century inventory of the possessions of King Louis XI of France. 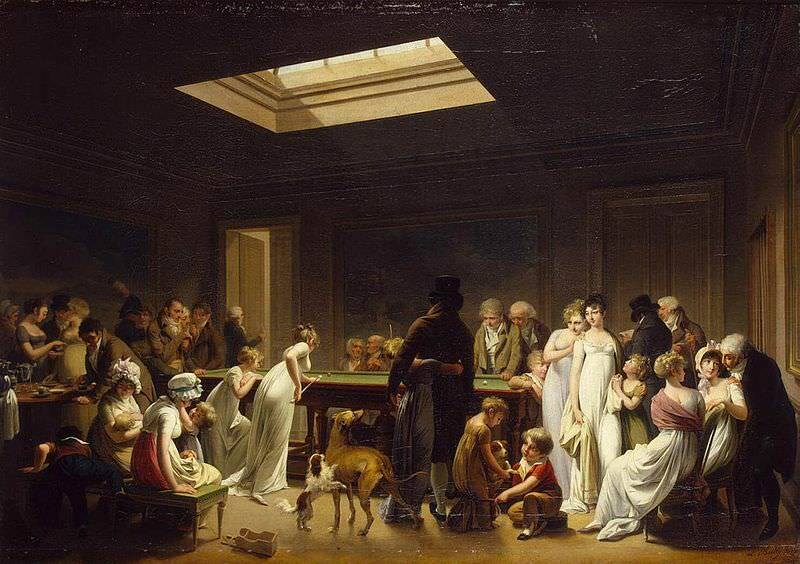 By the Napoleonic era, billiards was popular among all classes of people in France. In Napoleon in America, Frenchmen are playing billiards even as one of the characters is about to be executed. Napoleon’s private secretary Baron de Méneval tells us about a game of billiards Napoleon played with General Lannes when Napoleon was First Consul of France. Napoleon’s first wife Josephine also enjoyed a game of billiards, according to Napoleon’s valet Constant. In February 1817, Napoleon taught Betsy Balcombe, the teenage daughter of an East India Company superintendent on St. Helena, how to play the game. Napoleon used one of the rosewood billiard cues when superintending work in his garden, as both “a stick and a measure.” (10) When dictating his memoirs, he would spread out maps on the billiard table. Napoleon eventually made a gift of the billiard table to his servants, having noticed that they liked to play the game when he was outside. Visiting St. Helena in 1908, Lord Curzon found the table in an unused room at the back of Plantation House, the governor’s residence. It had been employed by one governor as a carpenter’s bench and by another as a screen across a door leading into the back yard. (11) You can see a photo of the table in the billiard room at Longwood House on my friend Margaret Rodenberg’s Finding Napoleon site. In this [French] village…dreary as it was, I found a café and a billiard-table. Where, indeed, in France will you not? Except in the merest jumble of hovels, you can hardly traverse a hamlet without seeing the crossed cues and balls figuring on a gaily painted house. You may not be able to purchase the most ordinary articles a traveller requires, but you can always have a game at pool. I have frequently found billiard-rooms in filthy little hamlets, inhabited entirely by persons of the rank of English agricultural labourers. At home, we associate the game with great towns, and, perhaps, with the more dissipated portion of the life of great towns. Here, even with the thoroughly rustic portion of the population, the game seems a necessity of life. And there are, too – contrary to what might have been expected – few or no make-shift-looking, trumpery tables. I like – no man likes better – to see the toilers of the world released from their labours, and enjoying themselves; but after all there is something, to English ways of thinking, desperately idle in the scene of a couple of big, burly working men, sitting in the glare of the sun-light the best part of the day, wrangling over a greasy pack of cards, or rattling dominoes upon the little marble tables. I once remarked this to an old French gentleman. Anonymous, A Picturesque Tour Through France, Switzerland on the Banks of the Rhine and through Part of the Netherlands in the year 1816 (London, 1817), p. 48. 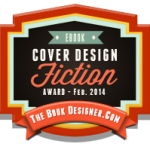 The Edinburgh Review, Vol. 34 (November 1820), p. 417. Claude-François de Méneval, Memoirs Illustrating the History of Napoleon I from 1802 to 1815, Vol. II (New York, 1894), p. 388. Sophie Cohondet Durand, Napoleon and Marie-Louise, 1810-1814: A Memoir (London, 1886), p. 221. Jean-Roch Coignet, The Note-Books of Captain Coignet, Soldier of the Empire, edited by Jean Fortescue, (New York, 1929), p. 197. Louis Constant Wairy, Recollections of the Private Life of Napoleon, translated by Walter Clark, Vol. I (New York, 1895), p. 73. Constant also noted that Josephine often played a game of billiards before breakfast (p. 331). Emmanuel-August-Dieudonné de Las Cases, Mémorial de Sainte Hélène: Journal of the Private Life and Conversations of the Emperor Napoleon at Saint Helena, Vol. III (London, 1823), p. 71. Lucia Elizabeth Balcombe Abell, Recollections of the Emperor Napoleon, during the First Three Years of His Captivity on the Island of St. Helena (London, 1844), pp. 158-159. Louis-Joseph Marchand, In Napoleon’s Shadow (San Francisco, 1998), p. 413. Louis Étienne Saint-Denis, Napoleon from the Tuileries to St. Helena, translated by Frank Hunter Potter (New York and London, 1922), p. 174. George Nathaniel Curzon, Tales of Travel (London, 1923), p. 168. Angus B. Reach, Claret and Olives, from the Garonne to the Rhone (New York, 1853), pp. 176-177. Napoleon played billiards very badly, without any attention, and ran about the whole time: he chose that time to give vent to his anger, or to scold, if he had anything to complain of.